At some point in the heritage conservation movement (memory serves it was during the nineteenth century, but I could be wrong) there was a significant change in the thinking around heritage ruins. Rather than being viewed as incomplete buildings, ravaged by decay, they were recast as romantic, enchanting, and haunting – a bit of a gothic dream, if you will. Of course, when visiting ruins today, they are still largely cast as romantic. One need only visit the ruins of an abbey, for example, to imagine that they are almost a set piece in a Jane Austin novel, with their manicured vegetation et al. In any event, the meanings and aesthetics of ruins got me thinking about their application in sport heritage. Photos of contemporary abandoned or ruined places have become ubiquitous. One need not look that far for pictures of abandoned cinemas, libraries, and churches in places like Detroit. Seemingly these photos are meant as a kind of warning, a bit of a memento mori. Perhaps they can be read as a warning against faith in capitalism and the free market, or of globalization, or even of how everything – even the most grand and ornate places – can be abandoned and forgotten. And, yet, there is still an aesthetic beauty to them. They are a warning, for sure, but one feels drawn to them, and imagines what it might be like to walk through these places, to experience them, to live near them and create great art based on them. Sport heritage, too, has its contemporary ruins and normally during the staging of mega events like the Olympics or World Cup, many photos of former venues – now abandoned and forgotten – become part of the social media landscape. This collection of photos, in particular, made its rounds through Twitterverse most recently. Indeed, there are warnings here too – about fallacy of sport event legacy (particularly when it comes to sports infrastructure), about the costs of staging a sporting event, and how sporting events are rarely ever panaceas in addressing larger socioeconomic issues – but, like those photos from Detroit, there’s also a beauty here. Indeed, the photos from places like Athens and Beijing are warnings – particularly given how recently these Olympics were staged, and how quickly these venues were mothballed. 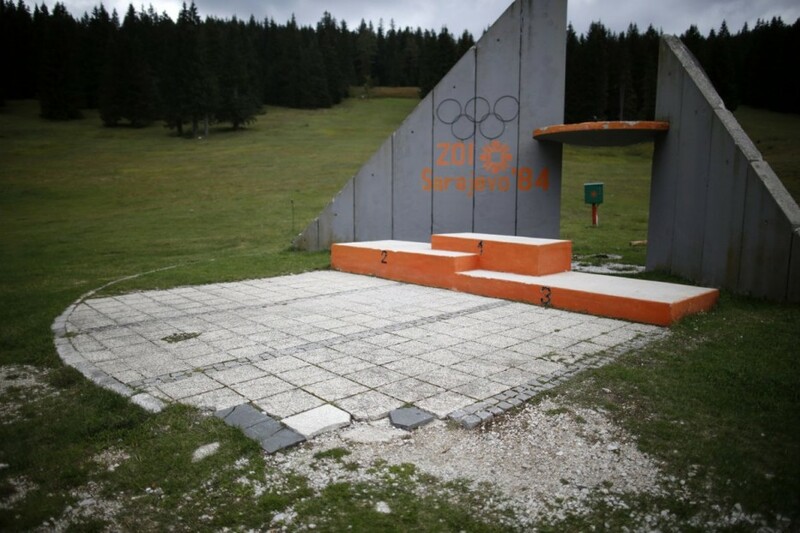 But, the ones from Sarajevo are very sad, given the post-Olympics history of that country. In any event, I am wondering how these places ought to be read, and how they fit into the broader history of heritage decay? Seemingly they share some history with their ancient and gothic cousins, but are they different because they are recent (both in construction and abandonment)? Are there broader issues here, too – about environmentalism, human conflict, or disposability of culture? By Gregory Ramshaw in Uncategorized on July 3, 2014 .